Everything goes back to God. Looking at the prayer of Jesus for all believers, I notice that Jesus prays what I call complete prayers. Right from verse 20, Jesus does not simply pray for his own disciples, he prays for all believers. He does not just pray for them individually, he prays for them that they may be one, united, and together. He does not just pray for the disciples to be in him, but in “us” directing focus back to God the Father. From God, he prays again with a link back to the themes of unity in Christ, reconciliation with God, and the spread of the gospel to all the world, demonstrating that God’s love had come to the world. Such prayers remind me of Acts 1:8, that when the Holy Spirit comes, the disciples were called to witness the gospel in Jerusalem, Judea, Samaria, and to the far ends of the earth. Another popular student's prayer comes in the following manner. There is a humour in it, but shows forth how incomplete it seems. I pray the Lord I won't go nutty. I pray the Lord that I won't flunk. And pile my books upon my chest. Even panicking parents often ask for prayers on behalf of their children. Why do I call this halfway prayers? When I look at how such prayers are understood in the light of John 17, I feel like I have not prayed in the manner Jesus had prayed. Jesus prayed: “My prayer is not for them alone.” How many of our prayers are “for us” or for certain people “alone?” Jesus stretched his prayers from disciples to all believers; from all believers to all non-believers. Jesus prayed for unity “that all of them may be one.” We pray for good exam results. We pray for calm hearts. We even pray for cool heads and comfort. What about our prayers bringing glory to God? How are our prayers patterned after Christ in his love and concern beyond our small world into the larger world? Jesus prayed for the spread of the message of love. How are our prayers moving that forward? 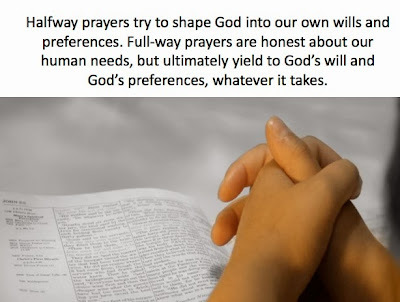 POINT: Halfway prayers are basically prayers of a person who desperately needs to grow beyond self-concerns. At Church, I see how people come together more when there is sickness in the family. Years ago, there was one Church I knew had a big prayer meeting attendance after the illness was discovered. Again, people who hardly come to Church suddenly appeared at prayer meetings. Many of these people realized that after medical science had run its path, they had nowhere else to turn to except God. They pray for concentrated healing for the person A or person B. Yet, it dawns upon me that their prayers seem to be “alone” for persons A or B. What about the world of sick people? What about the many people in hospices around the world? What about those inside the Church like persons C, D, E, F, G, who are also sick but we do not know about them? In halfway prayers, people get satisfied just to hear their own prayers. They never go beyond personal concerns. For all their concern about one another, they fail to show similar concerns toward the people in the world at large. They are more interested to pray for their own things, and not in the way that Jesus had prayed. Thankfully, Jesus did not pray “halfway prayers.” Remember how Jesus’ prayer grew from disciples to all believers; from all believers to all the world; and that all the disparate believers will be united; and how all of these bring glory to God? That is a full-way prayer. POINT: Half-way prayers are incomplete prayers. Anyone desiring to pray like Jesus must learn full-way prayers. These are hard words indeed. What Cyprian is saying is that if we fail to pray in the way the Christ had prayed, we are “ignorant and sinful.” If he is right, then the prayers that we are used to in our modern society are often more “ignorant and sinful” that we have thought. Is that too harsh? Maybe. Before we go off and dismiss this man of God, who were so instrumental in spiritual revival in North Africa in the third century, let us consider Jesus’ life. What if Jesus had prayed at the Garden of Gethsemane in a “halfway” manner? Hey! Jesus could have stopped right there. Take this suffering away. Take the cup of death away. Take the terrible pain and ordeal away. Away with this. Away with that. So help me God. We all know how Jesus continues on. This completes what a Christlike prayer is about. It is never about self-interest. It is never about worldly interest. It is all about God’s will. Asking God to take away the cup shows Christ’s humanity. Yielding to God’s will shows Christ’s humility. Readiness to do what pleases God proves Christ’s whole-hearted obedience. POINT: Full-way prayers are not about ignoring self-needs. It is about putting self-needs within a bigger picture of God's will. Halfway prayers tend to be overwhelmingly oriented toward one end. They are so earthly minded that they lack heavenly focus. The same is also true of the other end. There are people who are so heavenly minded that they lack earthly compassion. Both extremes are to be avoided. Jesus in John 17 prays not only for the will of God to be done on earth, he too prays for the will of God to be done in heaven as well. His eyes are on both the people as well as on God. He is mindful not just of what the people claim they need, but also what they truly need. In our halfway prayers, we tend to be so focused on the temporal that we are prepared to forsake the permanent. Just like Esau who gave up his birthright just to obtain temporary pleasure of stew to satisfy the self. Or King Saul who rushed the sacrifice and disobeyed the instructions from the prophet Samuel, simply because his eyes are not on God, but on self. One of the most obvious signs in halfway prayers is our tendency to desire something without the willingness to pay for it. We want the prize but we do not want the disciplines required to win the prize. We want the fruit but avoid the hard labour and investment to produce a good crop. We satisfy ourselves with things temporal that we forget that such things will not last. 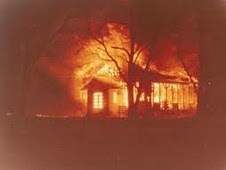 Let me close with a powerful message of conviction by a Nigerian pastor, Sunday Gomna, whose house and church buildings were burned by Muslim radicals. Although it is not technically a prayer, it is one that manifests a prayerfulness of a person utterly focused on God. Credit to Mark Meynell. My friends. Be not satisfied with halfway prayers that seem to try to shape God into our own wills and our own preferences. Pray in a manner to be shaped by God's will and God's preferences. In doing so, may we be molded more and more into the image of Christ.